Until the Arena Champion Match. 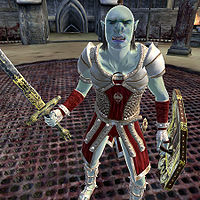 Agronak gro-Malog, more widely known as The Gray Prince, is an Orc with vampiric Imperial blood which lends him heightened abilities. He is the current Grand Champion of the Arena. In your final fight in the Arena, you will challenge him for the title and glory. Agronak believes he is of noble blood and will send you to Crowhaven to seek out his aristocratic father. Unfortunately, the reality is not exactly how he imagined it. Being the Grand Champion means two things: training and training. True to this, Agronak spends literally all of his day carrying out his regime. Once you have challenged him for his title, he will relocate in the Arena pit; waiting impatiently for the gates to lower. As soon as they do, his Aggression rises to 40 and he suffers a -100 disposition hit; which causes him to attack you. Should you have informed him of his bestial origins, his Aggression will then fall to 0, causing him to cease his attack, and his Health will suffer a 100 point drop. He will beg you to finish his life and then stand impassively as you hack away at him, awaiting the inevitable end. He always wears his Grand Champion gear - the Raiment of Valor - and complements it with a light shield and a longsword (which is leveled but will never exceed elven quality). He also carries two or three septims. Further augmenting his fighting capabilities, he possesses a special birthsign which fortifies his Speed and his Blade and Athletics skills. He also has a 20% resist to magic and normal weapons. It seems others have noticed his unnatural fighting abilities; as Owyn will remark: "Agronak is good, yeah. Too good. He says he's half Orc. What I want to know is: what's the other half? 'Cos it sure ain't human." When he first greets you, he will say "Hail, friend. I don't believe I've ever seen you down here in the Bloodworks before. Allow me to introduce myself. My name is Agronak gro-Malog." Every other time he sees you, he'll say "Hail, friend! Good to see you again. I hope the Arena has been as good to you as it's been to me. What brings you back to the Imperial City?" When asked about his title, he'll say "Yes, it's what everyone calls me. I guess I'm partly to blame. I've never made it a secret that I'm actually only half Orc. I am a Lord's son, yet I've been denied the noble privilege to which I am entitled. So I have become the Gray Prince, noble in my own right. Still... If I could prove who I really am, and show the world that an Orc can be noble in blood as well as deed... Maybe... Yes! You could help me!" When pressed for information during The Origin of the Gray Prince, he'll say "I grew up here in the Imperial City, but I was born elsewhere. My mother was a servant in the employ of Lord Lovidicus, and resided at his fortress. Lady Lovidicus was a shrew of a woman. The Lord and my mother grew close, and ultimately fell in love. I was the result of their union. When the Lady learned of my birth she was furious, and threatened to kill both my mother and me. So we fled, leaving my claim to nobility behind." When asked what it takes to become Grand Champion, he'll say "I'm the reigning Grand Champion of the Arena, you see. Once you become a Champion, you'll need to challenge me for my title. It's a fight to the death, so if you progress that far and want a shot at the Grand Championship, you'll have to try and kill me." Once you actually are a Champion, you can ask him to duel in the Arena. Should you change your mind, he'll have a different remark based on your actions earlier in his quest. If you haven't completed his quest he'll say, "You don't? Oh! Well good! Very good indeed! Maybe after you've helped me out, eh? So please, make haste to Crowhaven! This waiting is unbearable!" if you haven't started his quest, he'll say "You don't? Oh... Well, all right. I'm sorry, it's just that I fully expected a challenge! It is your right. If you change your mind, I'll be ready." If you finished his quest, he'll glumly say "You don't? Oh... Well I can only hope you'll change your mind. In the Arena... Yes, in the Arena anything could happen. Anything..."
If you agree to duel him, he'll say either "Oh! Oh, well... All right then. I was hoping you'd complete your journey to Crowhaven first, but it is your right to challenge me." Or "As I expected. I accept your challenge! Speak to Ysabel and let her know when you're ready, and I shall make for the Arena. Shinji be with us both!" Or "Yes. Yes... I accept your challenge. Go... Go speak with Ysabel. Tell her you're ready. Then we'll... We'll meet in the Arena. Yes, that'll do..."
Once you return from Crowhaven with his father's journal, Agronak will be horrified. He'll say "Now let me see what this Journal says! Hmm... Interesting... But... I... I... Wait... Can this be? But... By Shinji, I'm the son of a vampire! I'm no "Gray Prince!" I'm the spawn of evil! I thought my father was a nobleman, not some blood-sucking monster! I... I can't... All a lie! A lie..." After this, Agronak clams up, and is not responsive to anything you do. Then, in the arena, all truth will be revealed. He'll wail "Please, just kill me! Can't you see? It's what I want! I can't live like this, knowing I'm something filthy, something evil! Kill me!" His level is set at 10; this is out of sync with the leveling of the previous Arena combatants, and can make him a rather anticlimactic final opponent for a high-level character. 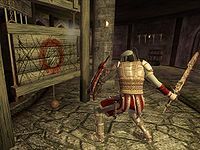 This issue has been addressed by the Unofficial Oblivion Patch; his level is set to player +10. Esta página foi modificada pela última vez à(s) 06h31min de 28 de janeiro de 2016.